Are you interested in purchasing a baseball radar gun? If the answer is yes, then you should know everything about the best baseball radar guns on the market right now. But first, what are the most crucial factors you need to take into consideration when you’re buying a radar gun? Here, you’ll find information about the most accurate baseball pitching speed guns. I highly recommend you sit down and enjoy the entire article. But, if you don’t have time to do it, then I’m offering you a quick recommendation about the radar guns. What do Baseball Coaches and Parents think about Pocket Radar? How does a speed camera or radar gun work to measure pitching speed? Are radar guns accurately measure pitching speed? What is the best radar gun for baseball? What is the distance to accurately measure pitching speed with a speed gun? Are radar guns used in MLB? Can I use my baseball speed gun for softball and other sports? If you want a radar speed gun to measure your pitching or hitting speed, then I highly recommend Pocket Radar Ball Coach Radar Gun. I am recommending it to you because it is super accurate. When it comes to accuracy, it is as accurate as the radar guns that cost more than $1000. I’m not just saying, the accuracy of Pocket Radar is tested in the labs, and the results were same. This below mentioned video explains how Pocket Radar works as compared to the expensive speed guns. And, you don’t have to pay a lot of money; you can buy Pocket Radar by paying nearly ¼ of the price of expensive guns. The built-in memory can store up to 25 previous speeds. So, you can keep track your performance and review it to take your performance to the next level. You can track your fastest pitch of the day, and do it for the next 25 days. You’ll get extremely helpful data about how you’re improving day by day. Imagine what’ll happen, if you can dramatically increase your pitching speed and hitting speed with the help of this speed gun. It not only works with baseball, but you can also use it to measure the accurate speed of softball, volleyball, tennis, or even moving vehicles. If you want to save money, then I’ll suggest you take a look at Bushnell Velocity Speed Gun and Classic Pocket Radar Gun. Both of these speed guns are cheaper than the Ball Coach Gun. But, from these two, my personal preference will be Classic Pocket Radar Gun. If you take a look at the product description, you’ll find that it is not meant for ball sports. But, if you see the reviews, you’ll see that a lot of baseball & softball players use it to accurately measure their pitching speed. I prefer it more as compared to Bushnell Velocity Speed Gun, because it is more accurate. Yes, Bushnell is slightly cheaper, but you’ll get what you pay for. It is not very accurate. If you just want a rough idea or you do not want a super accurate speed gun, then it’s good. It’ll save you some money, and provide you with some good data. In this video, Marco Rivera, Father and a Coach, tells how this speed gun helps them, and what he thinks about it. 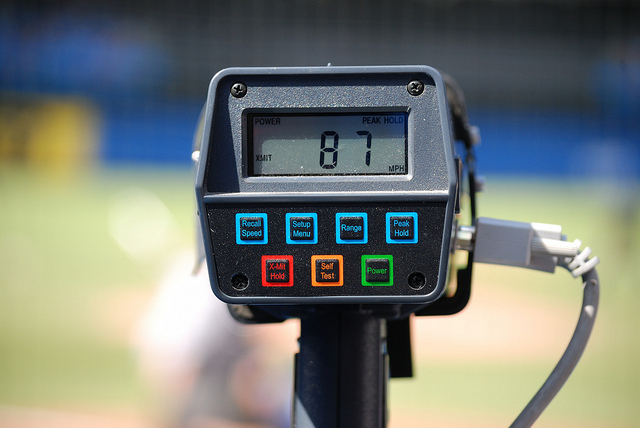 Distance is the most important feature to consider when purchasing a radar gun for baseball. Do you know at which distance are you going to be standing? Are you going to be right behind the home plate or further away? It’s important to determine your position as a baseball coach, which means: Are you a major league baseball coach or a little league baseball coach? If you’re going to be scouting for major league baseball players, you’ll need a radar gun with higher distance range. The higher range comes with higher prices. If you’re a peewee level coach, you won’t need a radar gun with higher distance range. In this case, you can opt for other options. Every radar gun has an objective. In this case, I’m looking to offer you the best baseball radar guns. That’s the reason why I need to take into consideration elements like pitch speed improvement, baserunning speed improvement, and session reviewing. An accurate radar gun is a gun to judge the speed and trajectory of the ball much better. Usually, accurate guns are more expensive. As you might already know, the only way of knowing if a radar one is accurate is by comparing its performance with other radar guns. So, whatever gun you purchase, make sure to check the accuracy of that radar gun. The best radar guns have the possibility of recording your progress. This is essential for keeping a track of your pitch speed. It’s important to understand how the radar is power on. Some radar guns use rechargeable batteries. When purchasing this type of radar gun, you must know which batteries the device uses and the size. Additionally, you must test the product to see how long the batteries last. Radar guns come in varied sizes. These products can be as small as the Pocket Radar Ball Coach / Pro-Level Speed Training Tool and Radar Gun (4.6 x 0.8 x 2.3 inches) or as big as the Jugs Baseball Radar Gun (14 x 10.8 x 4.2 inches). Bigger size doesn’t imply better performance. You must calculate the budget you have for buying a radar gun. Depending on your estimated budget, you’ll be able to decide which radar gun is better for you. The Bushnell Velocity Speed Radar Gun is a point-and-shoot radar gun pistol. This baseball pitch speed radar gun has a +/- 1.0 MPH (2 KMP) level of accuracy. It can be used for baseball, softball and tennis practices because it has a range of 10 to 110 mph (90 feet away). Moreover, the Bushnell Velocity Speed Radar Gun can be used for measure car speed since it has a range of 10 to 200 mph (1,500 feet away). The Bushnell Velocity Speed Radar Gun product measures 4.3 x 8.4 x 6 inches and weighs 19 ounces. It has a large and clear LCD display which makes it easier to read the speed even if the sun is really high. This pitching speed gun comes with a “point and squeezes trigger system”. It consists of lining the gun with the object and pulling the trigger. Thanks to this system, the Bushnell Velocity Speed Radar Gun is quite easier to use. This radar gun operates on 2 Alkaline C batteries. The Bushnell Velocity Speed Radar Gun with a display can do at least 500 readings before the battery dies. Remember to put the batteries on the negative side facing you and the positive side inserted at the tip. The Bushnell Velocity Speed Radar Gun comes with 2-year warranty. Still, people have had some complaints about the Bushnell Velocity Speed Radar Gun. Some say this product doesn’t do accurate readings. The difference is 3 – 5 MPH compared to other products. Other people have complained about its distance range. They claimed the Bushnell Velocity Speed Radar Gun doesn’t do proper readings from 90 feet away. Moreover, they have said the product only works if you stand as close as 30 – 35 feet away. Point and squeeze trigger system. The batteries are not rechargeable. The Bushnell Velocity Speed Radar Gun is a good radar gun for Little Leagues baseball coaches. Its price is quite reasonable compared to other radar guns. Additionally, this product is perfect for beginners since it’s easy to use. The Stalker Sport 2 Radar Gun is one of the most accurate radar guns in the market. This radar gun captures the exact pitching and baserunning speed simultaneously. It has a 300-foot range, further than Bushnell Velocity Speed Radar Gun. This radar gun measures ball speed from 5 – 150 MPH. Moreover, the Stalker Sport 2 Radar Gun has an accuracy of +/- 1 mph. The Stalker Sport 2 Radar Gun measures 6.5 x 3 x 8 inches and weighs 1.75 pounds. It uses 6 non-rechargeable Alkaline batteries. You can use this product for almost 20 hours in a row without worrying if it will turn off. The Stalker Sport 2 Radar Gun has a point and shoot system which makes it very easy to use. Moreover, it comes with a 1-year warranty. Another splendid feature about the Stalker Sport 2 Radar Gun is its concurrent radar and stopwatch operation. You’ll be able to record pitching and baserunning speed at two separate windows, and you can check this information afterward. But the Stalker Sport 2 Radar Gun also has its cons. First, this radar can only record your last 5 pitches when it’s on. Once you turn it off, this information is gone forever. Second, compared to other radar guns, this one is more expensive due to its features. Concurrent radar and stopwatch operation. 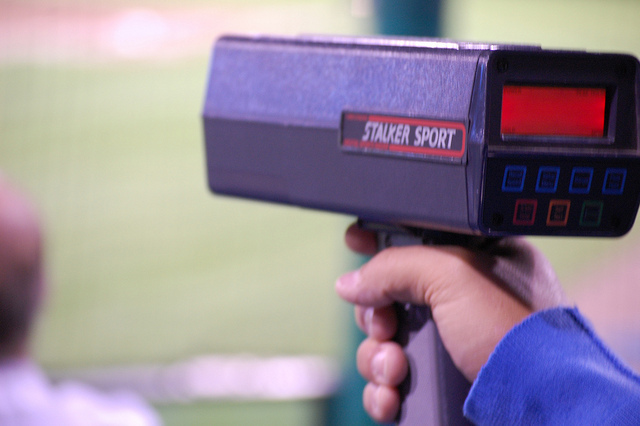 The Stalker Sport 2 Radar Gun is a high-quality product for coaches who work in the major leagues. It has been said this is the go-to product for 30 Major League Baseball teams all over the world. I recommend you this radar gun if you’re interested in a product of higher quality. The Pocket Radar Ball Coach is completely different from the ones we have reviewed before. This radar gun size is 2.3 x 4.7 x 0.8 inches and weighs 4.5 ounces. This is a resistant product since it’s made from the same “high-impact plastic” used in hockey helmets. This radar gun measures 25 to 130 MPH (40 to 209 KPH). Furthermore, it has a range of 120-feet. 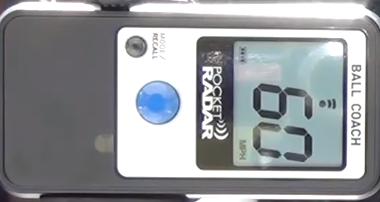 The accuracy of the Pocket Radar Ball Coach / Pro-Level Speed Training Tool and Radar Gun is +/- 1 MPH (+/- 2 KPH). You might think this radar gun is tiny, but it has powerful modes such as the Constant-On, Clear Memory, Changes Unit (MPH to KPH), and Immediate Shut-Down. The Pocket Radar Ball Coach / Pro-Level Speed Training Tool and Radar Gun can store up to 25 readings in its deep memory. 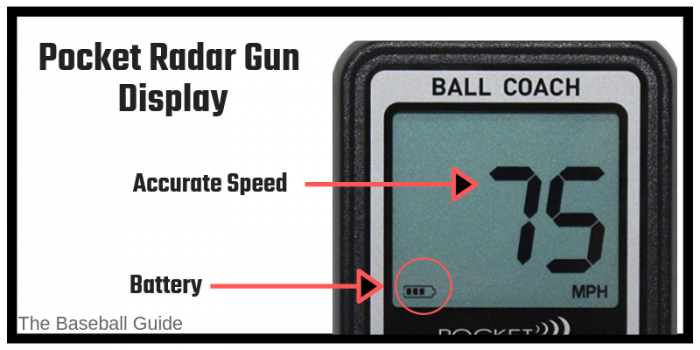 The Pocket Radar Ball Coach / Pro-Level Speed Training Tool and Radar Gun uses 2 Alkaline batteries. The battery life of this radar gun surpasses any other product since it can do 2,000 readings in “user-triggered” mode. By using rechargeable batteries (AAA NiMH), you can double up your readings. The Pocket Radar Ball Coach comes with a belt holster case, a wrist strap, and 2 non-rechargeable Alkaline batteries. This product can be used in hands-free mode, but it doesn’t come with the tripod you might see in the photos. The Pocket Radar Ball Coach was named the best radar gun at the 2014 American Baseball Coaches Association National Convention. Andy López, the three-time National Coach of the Year, said, “If you are looking to elevate player performance, you need to own the Ball Coach”. The price of the Pocket Radar Ball Coach / Pro-Level Speed Training Tool and Radar Gun is not as high as you imagine. An excellent feature of a product with many complimentary reviews. Does the Pocket Radar Ball Coach / Pro-Level Speed Training Tool and Radar Gun have any drawbacks? Its “easy automatic operation” might not be as easy as it seems. Some people have complained the button is hard to press. Up to 25 record readings. From 2,000 to 4,000 readings. The button is hard to press. It doesn’t come with a tripod. The Pocket Radar Ball Coach / Pro-Level Speed Training Tool and Radar Gun is an excellent product for Little League and Major League Baseball coaches. The Sports Sensors Swing Speed Radar is a small “microwave Doppler radar sensor” that measures baseball swings speed. It can calculate the speed of objects going from 20 – 200 MPH (32 – 320 KMP). It can be positioned within from 8 to 10 inches “from the tee or suspends from a batting cage or net”. The accuracy is +/- 1 MPH. The Sports Sensors Swing Speed Radar can display in MPH or KPH. The size of this product is 7.2 x 5.4 x 4.6 inches. The Sports Sensors Swing Speed Radar weighs 10.2 ounces. The display type of this product consists of a 3 segment LCD. This product comes with a metal stand which means you won’t need to hold it. With the Sports Sensors Swing Speed Radar, you can measure tempo time and swing speed separated or together. The Sports Sensors Swing Speed Radar uses 3 AA Alkaline batteries. This radar turns off after 5 minutes or not being used. As you can tell, this product doesn’t come as close to the others we have reviewed. The Sports Sensors Swing Speed Radar has the same accuracy, but it must be used really close to the players. Moreover, this product doesn’t record readings. Overall, the Sports Sensors Swing Speed Radar is an excellent product for people who are just starting to be coaches. I think it’s great for practicing but you have to resource to other radar guns once your start ascending in your job. The JUGS Baseball Radar Gun competes with the Stalker Sport 2 Radar Gun for the title: best radar gun for Major League Baseball coaches. The size of this radar gun is 14 x 10.8 x 4.2 inches and it weighs 3 pounds. This radar can work up to a 300 feet distance. The JUGS Baseball Radar Gun can measure the pitching and plate speed at the same time. This radar gun operates in 2 modes: Trigger and Continuous. Trigger Mode is done while pulling the trigger. This mode can record the speed “on the radar gun for the duration you set in the menu”. The default time is 5 seconds. In the Continuous Mode of the JUGS Baseball Radar Gun, you can pull the trigger twice and the radar gun will read the pitch automatically and “the speed of the pitch automatically then clears itself to read the speed of the next pitch”. This radar gun can recall the last 5 pitches made by the player. The JUGS Baseball Radar Gun uses 6 NiMH rechargeable batteries that last a week. These batteries are completely recharged in 2 hours. This radar gun has a data port for transmitting the recorded information to a computer. The JUGS Baseball Radar Gun has a speed range of 5 – 140 MPH. The speed can be display at MPH or KPH. Moreover, this radar gun has an accuracy index of +/- 0.5 MPH. The big drawback of this gun is its price. The JUGS Baseball Radar Gun is even more expensive than the Stalker Sport 2 Radar Gun. Measures pitch and plate speed. 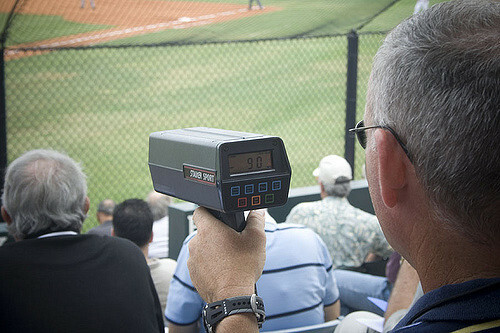 According to the JUGS website, this radar gun is the “main tool in discovering new pitching prospects”. I do think is a great tool for Major League Baseball coaches due to its features and price. You may have thought about it like how a radar gun quickly measures the speed of a pitch from 20 to 30 feet away. The answer is little technical. The antenna present in the radar gun sends a signal and some energy from that signal bounces off the baseball, and it comes back to the sensors of the speed measuring gun. Then, after doing the calculations, it measures the accurate pitching speed on the display screen. Even, the radar guns used by police to measure fast moving objects and guns in other sports works on the same principle. The answer is Yes. Whether you use a radar gun to measure pitching speed or any moving object, you can trust its accuracy. In general, you can expect 1 mile per hour more or less on the real speed. This is a general idea because some expensive speed guns are so accurate that they can measure the difference of up to 1/10 mile per hour. So, the more you spend, the more accurate your speed measuring gun will be. But, even for an affordable pitching speed gun, it’ll be pretty accurate for a normal sportsperson. They’re so accurate that in the past they have been used as an evidence in the court. The best speed gun for measuring pitching and hitting speed is Pocket Radar Gun. There are so many things that make it one of the best options for the sportspersons. Players need to improve their performance; therefore, they have to compare their pitching speed. With this device, you can not only accurately measure the speed; the built-in memory feature allows you to store up to 25 previous speed tests. So, you can compare your last 25 speeds, and observe how you perform. Whether you play baseball, softball, volleyball, cricket or hockey, you can use it and improve your performance to become better than yesterday. Along with that, the compact design and easy to use functionality makes it the favorite of coaches and players. 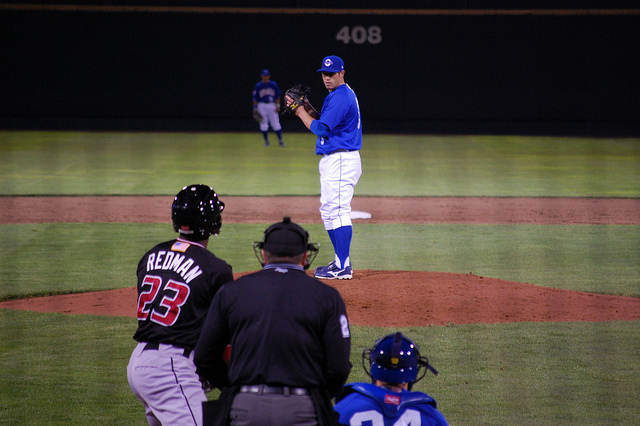 A sports radar gun can accurately measure the speed from approximately 100 feet away. This is just a general estimate because this distance range depends on the price of the device. The expensive speed guns offer more distance range as compared to the budget-friendly ones. Yes, the radar guns are used in the MLB. Not only MLB and baseball leagues, but it is also used in other sports like tennis, volleyball, cricket, hockey and more. Yes, the same velocity speed gun that you use to measure pitching speed and hitting speed can be used for other sports like softball, volleyball, tennis etc. Not only tennis, but you can also measure any fast moving object like any vehicle. Taking of this information into consideration, I believe the best choice you can opt for is the Pocket Radar Ball Coach / Pro-Level Speed Training Tool and Radar Gun. This is the best radar gun for baseball pitching because it complies with the requirements of the Little and Major Baseball League. Still, you can choose any radar gun you like the best. Remember these tools are perfect for discovering new baseball stars. Marucci CAT 7 Baseball Bat Review | Is CAT 7 Worth Buying in 2019?